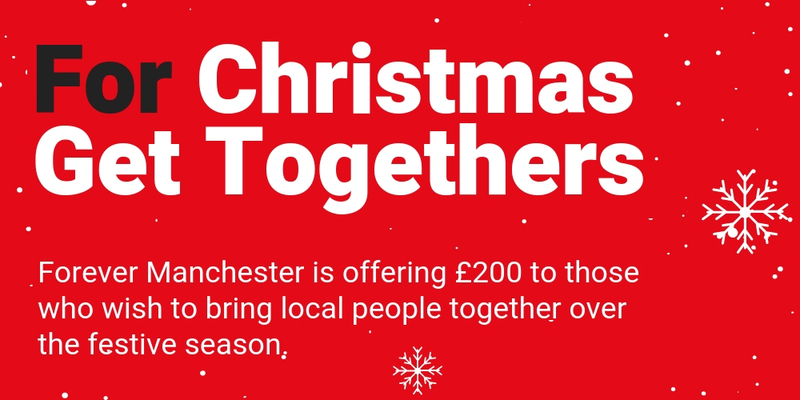 Forever Manchester is delighted to announce that we will once again be offering £200 to those who wish to bring local people together over the festive season. We believe that connected communities make stronger, happier communities and love any event that brings people together, so we’re delighted to offer our support to people who wish to celebrate where they live with a Christmas gathering! So what kind of event can we support – well it’s up to you, we’re just here to provide that bit extra help you might need to make it happen. Your event could be big or small, in a community centre, scout hut, park or wherever you fancy, it’s whatever you and your neighbours decide. Who knows, our very own Captain Manchester might even drop in to enjoy your festivities with you! Applications close on Friday 23rd November at midday. If we receive more eligible applications than there are awards available, decisions will be made via a draw. Successful applicants will be informed by email on Friday 30th November and payments released the same day.